As modding's become an increasingly international affair, one thing many of us have had to do is ship systems abroad. One issue always persists though: how to do it safely? We all know that delivery companies and customs have a habit of playing footy with our parcels, so how to get around this? Well, specifically for international shipping, you want to use a crate and a pallet, but what about if you just want to take your rig to LAN safely or you're moving house, etc.? For me, I like to build flight cases for rigs that will be moving a lot. It's a trick ripped straight from event organisers who have to do this on a daily basis with high-end audiovisual equipment. Surprisingly, it's also something you can do at home with some fairly basic tools; the trick is mostly finding out what materials you need to make one. Let's delve in and take a look at what it takes. As with many tasks, planning is the real key here. You need to construct a checklist of exactly what you're going to want to use, the quantities, and also how you intend to construct it. The best place to start is figuring out how big the case needs to be. To start with, measure the length, width and height of the object/s you want to encase. Since we will be lining the inside of the case with protective foam padding, you need to remember that it will increase the size of the case. 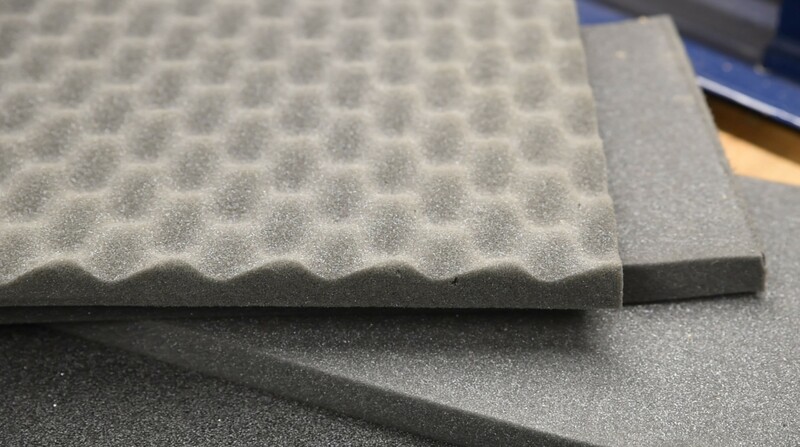 Choose which foam thickness you want to use, then add that to the dimensions. I generally use 30mm thick foam, so I add 60mm to my measured dimensions (30mm to every side). The example I'm working with here is a Thermaltake View 27, which is roughly 470 x 200 x 500mm (Length x Width x Height), and adding the foam I get the dimensions 530 x 260 x 560mm. The size of your box with the padding included will be your panel sizing. For my case that means I need two panels at 530 x 560mm, two at 260 x 560mm, and two at 260 x 230mm. These dimensions will also be the same for the metal extrusions when purchasing. The next step is considering what tooling will you need. Here's a list of what I would call the minimum tooling, followed by ones that can be used to make the job significantly faster/more accurate. Here's a checklist for the materials you will need. I will explain some options further down. Basically everything I use is made by Penn-Elcom, which has a webshop that covers a lot of territory. You can also find its parts through local resellers; most flight case part suppliers online will stock Penn-Elcom hardware, as it's the go-to brand. Personally, I like to use 6mm ply for cases, as it's simple to work with, pretty inexpensive, and also easy to source. There are also alternatives like polypropylene board, which is lighter and very strong but more expensive, or hexaboard which is just pre-coated ply. I've used MDF for this particular case, but I don't recommend it as it's more hazardous to work with, heavier, and hates any moisture. The panels will need to be coated to prevent wear and add some extra protection. I use this as an opportunity to make the case more visually appealing, so go with thicker automotive vinyls, which come in a range of finishes. I'll be using 3M Silver Carbon Dinoc. I've used the cheaper stuff before and it's rubbish; get the real deal. Alternatively you can also use protective paint. I've not done that myself before so can't really advise, but it's a method used in industry certainly. This is where sitting down and having a think really pays off. There are a lot of choices out there, all with various pros/cons. I love using the N-Case system hardware, as it takes almost all the pain out of the process. These are the extrusions I use in this guide.The panels slot into the extrusions, meaning you don't have to make a standalone box to begin with. You also don't need to cut angles or buy corner braces if using that system, as the corner pieces get hammered into the metal parts themselves. A handy thing is that these are fairly self explanatory. 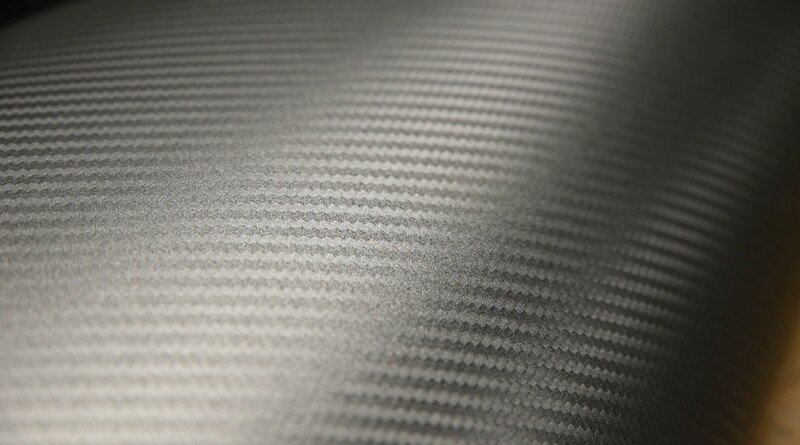 Where you have edges, you need an extrusion. For my case, I need them on the top and the sides. Since I'm using the N-Case system I won't be needing them for the base; I will explain why further down. We're going to need a way of getting into the case, so this is where your lid comes in handy. You can place this where you like, but I like to put lids as the base actually, as it's much easier to lift the box over a PC than to put a PC inside the box from the top (think of a 40kg watercooled rig in a giant case...). I really like using the Lid and Basemaker extrusions for this, as they're taller than the corner extrusions so accommodate the packing foam well and mean there's less work to do. The lid extensions are straight edges that come with a lip on them. This allows them to mate, creating a nice fit for the case. You can also get ones with a rubber gasket inside for superior weather proofing. The hybrid type is the easiest to work with, and it's both male and female so you don't need to buy lots of varieties and remember which is which; just turn it around to change the orientation. Sticking to the theme from earlier, I'm using N-Case system corners. The advantage is that they have moulded tabs that insert into the extrusions (with a bit of force! 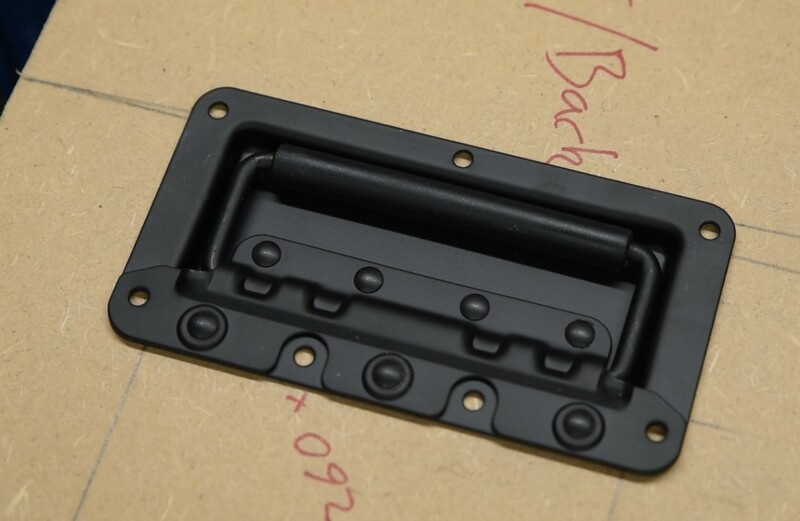 ), and this makes assembling the case unbelievably simple later on. If not using the N-Case system, you will want to buy metal corners that sit on top of the extrusions. 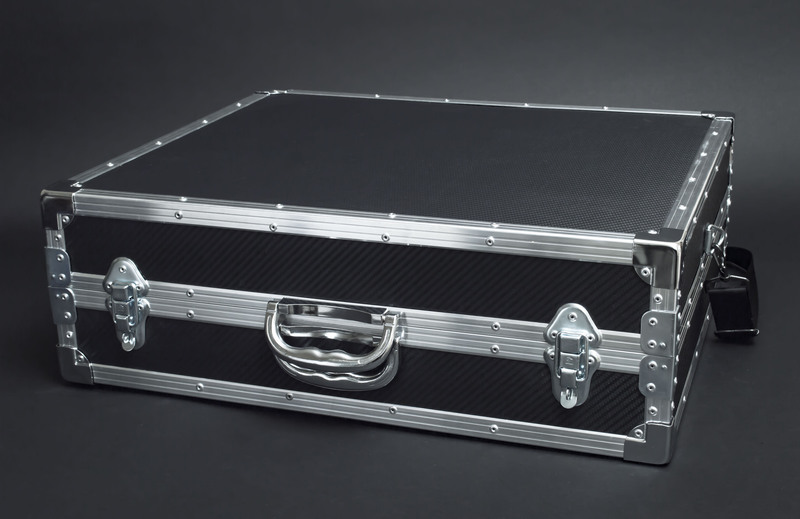 They not only provide more structure to the case but also protect others from sharp edges. There are also options here for ball corners, which act like case feet and are most often used when making boxes designed to stack. These are optional because you don't always want them. Hinges are great for shallow cases like the one pictured further up but pretty much useless for a deep box with a thin base. Consider which hinge style might fit your design, but if you don't need them, don't bother. Some hinges have stays on them so that a lid is propped up when open, others are recessed into the case (will have to cut into the panel), and others simply sit on top. As with hinges, handles depend on the usage. I like to put recessed handles on the sides of cases, as it makes putting the lid over the PC simple and they're neat, plus installation is quick. There are loads of options here, so just shop around for what you like. Latches are pretty essential, as you need a way to secure the case. As with handles, though, shop around and see which suits your intended use. I like simple ones that just rivet on top of the extrusions, because they're strong and quick to install, plus they come in a variety of finishes and styles. Typically I budget four latches per case just so they have even loading when full (mine take the full weight of the system inside as they're on the base). Case feet are definitely a good idea. They're cheap and will keep the case in good condition. 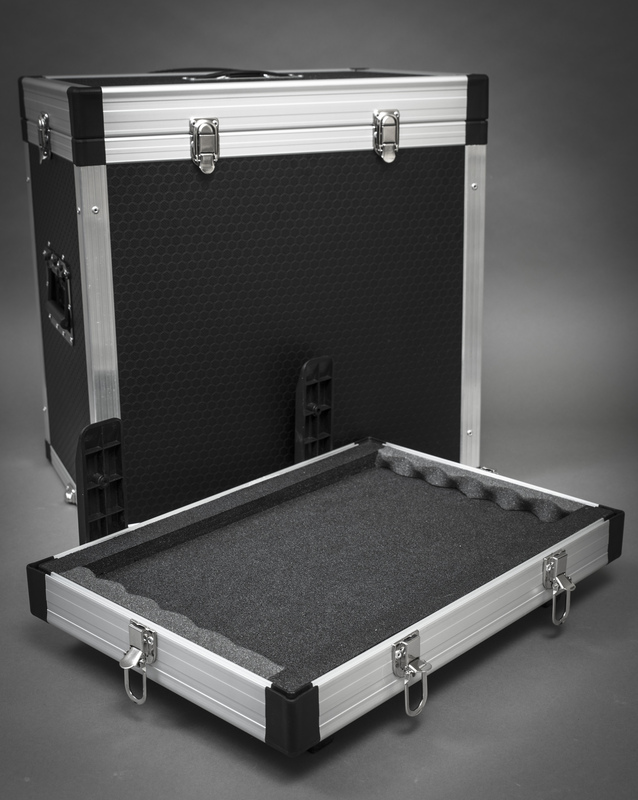 If your case is going to weigh a lot when full, you can always add casters to it so that it can be wheeled around. For the load bearing parts, use a denser foam like EVA or similar, it will offer more support and won't deform too much. For the sides and top, 30mm eggbox/convoluted foam works really well; you can fit it very snugly and it will hold the object in place, but 50mm also exists if you want extra security. Order the foam larger than the panels, as the extrusions will add some mm here and there so you want to be able to take that into account. In particular the Lidmaker extrusions can add a fair bit of height to the case, so make sure you consider that first. Screws are pretty self explanatory; if the part needs them, choose the size that will fit what you're making. I use screws for case feet and some latch varieties where rivets are a pain or don't work. For rivets, there definitely is something to consider. You want to use ridged ones designed for wood, and 4mm is good for hand riveting. Standard pop rivets work fine on metal, but the ball end can rip through wood under load, while the ridged kind will offer a tremendous amount more strength in the same material:100% worth looking into. You'll also need a pop rivet gun in case you don't have one; luckily the Bahco one is cheap and thus far has lasted me well, but it is a lot of work. I previously had a B&Q own-brand one, but it broke in a single day, so don't bother with convenience. Like most things B&Q, it was a load of rubbish. We're now ready to start building this thing!